RORY McIlory’s connections with Ballyliffin golf club helped secure the 2018 Dubai Duty Free Irish Open for one of the ‘best kept secrets’ in Irish golf. Those who have played Ballyliffin, situated on the tip of the Inishowen Peninsula, appreciate the quality of the test on the Glashedy Links, designed by Pat Ruddy. Ballyliffin’s golf offering includes the Old Course, giving the club a 36-hole complex set on prime golfing terrain. Today’s confirmation of that the DDF Irish Open goes there next year, and that the dates are July 5-8, means that Ballyliffin will finally be exposed to the world via the massive media coverage accorded the tournament. Extensive negotiations have taken place to secure the championship for Ballyliffin with Rory McIlroy and his Foundation having a key role in the decision. John Farren, General Manager of Ballyliffin spoke about McIlroy’s role. 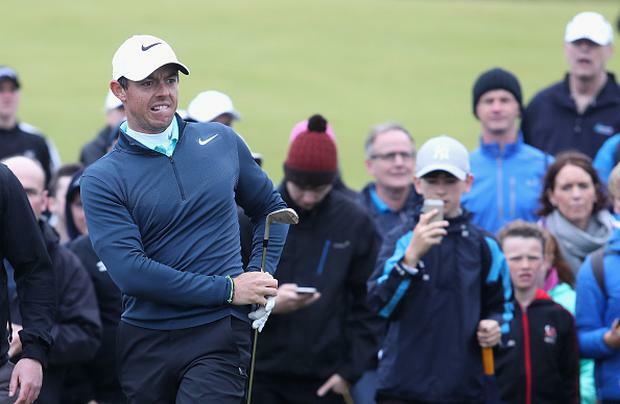 “From a very early stage it was evident that Rory McIlroy was going to be the real deal. “Rory first came to Ballyliffin in 2005 for our Scratch Cups and he and his father, Gerry, attended every Scratch Cup until he turned professional. “Rory played in a successful interprovincial Ulster inter- provincial team there in 2006, and we made him an honorary member, just prior to him turning professional and he was 16 at the time. “Rory was part of the Faldo Series, and came to Ballyliffin for a week and just coincided with the revamping of The Old Links by Nick Faldo in 2006. Both Rory and Nick played in the opening fourball for the re-designed Old Links, so he has a long association, and both he and his father have a great love for Ballyliffin and the area. The staging of the DDF Irish Open, which again will be part of the Rolex Series of tournaments which offer a minimum $7 million prize fund, is the most positive news the members of Ballyliffin and the people of the surrounding area could get at this time. Keith Pelley, the Chief Executive of the European Tour, speaking during the final day of this year’s tournament at Portstewart, said: “I am delighted to announce that the 2018 Dubai Duty Free Irish Open hosted by the Rory Foundation will be played at Ballyliffin Golf Club next July. “It is one of the great and historic events on the European Tour, raised to a new level in recent times by the commitment of our title sponsor Dubai Duty Free and by the support of our own Rory McIlroy and his Foundation as hosts. Colm McLoughlin, Executive Vice Chairman and CEO of Dubai Duty Free, said: “We are delighted that Ballyliffin Golf Club in Inishowen, Co Donegal has been chosen to be the venue for next year’s tournament. The setting is spectacular, it is home to two of Ireland’s best links courses and we know that the international visitors who will come to Donegal will really enjoy the scenery and the dramatic landscape. “Next year will be our fourth year as title sponsor of the Dubai Duty Free Irish Open hosted by the Rory Foundation, we very much enjoy working with our partners in the European Tour and indeed Rory McIlroy himself who has been a marvellous host for the last number of years. Barry Funston, Chief Executive of the Rory Foundation, said: “It is great to be involved with the tournament and we’re slowly moving around the country, taking it to all corners.